From February 15 to 17 2019, the 9th edition of the Mondial du Tatouage Convention took place the 9th edition of the World Tattoo at the Grande Halle de la Villette in Paris. On this occasion, 420 tattoo artists from around the world made the trip. While last year’s Journal of Japan introduced you to the traditional art of Japanese tattooing, this year we had the opportunity to meet an amazing tattoo artist: Horitaru. South Korean, the latter specialized in traditional Japanese tattooing. A very enriching artistic meeting. In 2018, we tackled the vast subject of tattooing with dissonances between the evolution of Japanese mores and legislation around the world of tattooing. Indeed, although this change in body was increasingly accepted by the Japanese, the law always made artists outlaw. It was mandatory to have a doctor’s license to be able to tattoo. In South Korea, the tattooing community is experiencing the same problem. With the worldwide popularization of KPOP, tattooing is less and less perceived as negative in Korea. Indeed, with artists like G-Dragon (who owns at least 24 tattoos) or Bang Yongguk (B.A.P group) whose older sister is tattooed, the Korean public has begun to rediscover this art often associated with Mafiosi. However, although it is not forbidden to be tattooed in South Korea, the law implies that the tattoo artist is a doctor because the tattoo is perceived as a surgical act. Tattoo parlors and artists are therefore forced to live in hiding to exercise their art. While Japan has taken a first step towards change by recognizing the Ainu people, for whom tattooing is an institution, what about South Korea? 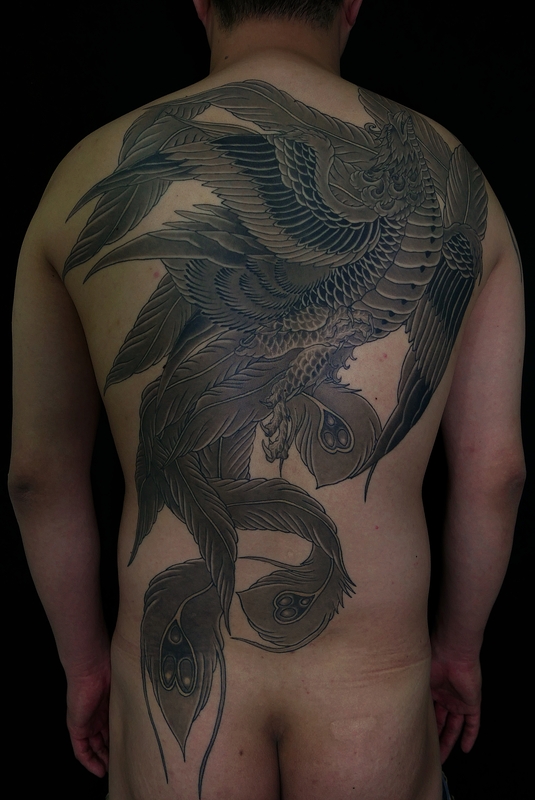 With this and other questions in mind, at the 2019 edition of the Tattoo World, we met Horitaru, who had traveled from South Korea to present his work to the French public and to the world. Accompanied by his apprentice, he proposed many flash (non-unique tattoo selectable in a catalog) in the traditional Japanese style, Irezumi. This art of tattooing aims to cover large parts of the body such as the back or the legs for example, even the body in its entirety. Journal du Japon : Hello Horitaru, thank you for agreeing to meet us. You are Korean and have chosen to become a tattoo artist. How did you discover the world of tattooing? And why did you choose to become a tattoo artist? 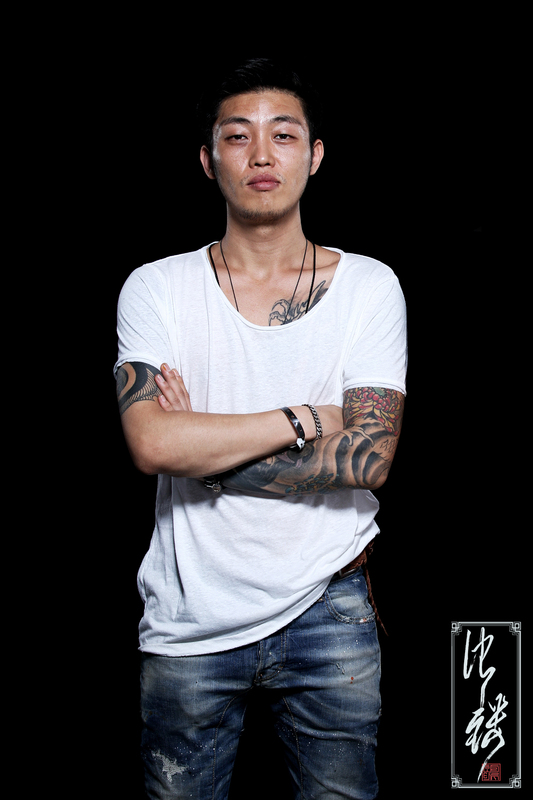 Horitaru : I started tattooing for the first time 14 years ago. At that time, it was not easy to find a tattoo parlor. I have always been interested in tattooing since I was a child. I also had fun drawing on the bodies of my friends. When I was 20, I got a tattoo for the first time. I felt even more attracted to the tattoo. I started getting more and more tattoos and gradually felt the need to do my own work. So I started to learn and I decided to become a tattoo artist at 25 years old. How did your tattoo training go? Today, I think there are some great places to learn tattooing. However, when I started tattooing, I could not find a place to learn. At this point in your career, you will learn good teachers if you find them. He had to learn to imitate. I mostly learned as an autodidact. In France, tattooing is always associated with unhealthy excesses like drugs, alcohol, etc. What about Korea? Korea also has a vision very similar to that of France. In the past, there were many misconceptions that only gangsters were tattooed. But now unlike in the past, many people like tattoos and think it’s about self-expression. The prejudices seem to have disappeared a lot and I think that the future will be better. What was your family’s reaction when they knew what your career choice was? When I started tattooing for the first time, my family did not refuse it despite the negative images around it tattoo. 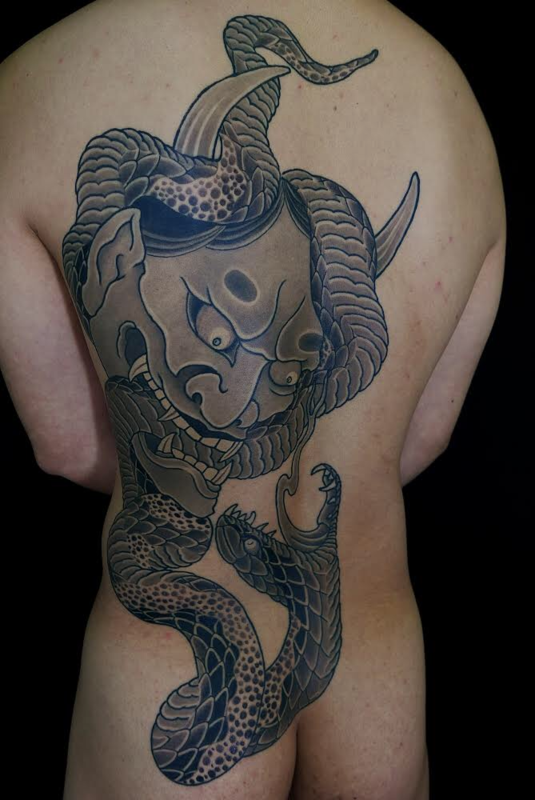 We know that Japanese mentalities are slowly evolving towards a better acceptance of tattooing. What about Korea? A lot has changed about being tattooed in Korea. I think Korea is more open than Japan on tattoo acceptance. Have you noticed differences between countries during your travels? I have traveled to many countries for tattoo conventions. In the end, I obviously felt the cultural difference. But it was not specific to tattooing, it’s the same thing when you travel and it was also a cultural difference for the people who lived there compared to me. But that’s also the interest and in general I immerse myself in the bath pretty quickly, after a day I do not really feel it anymore. 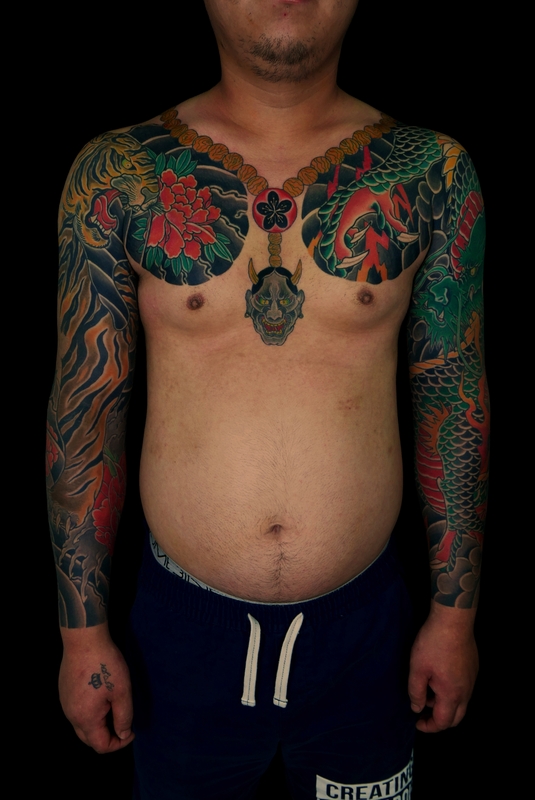 You have made the choice to specialize in traditional Japanese tattoo and you wear elsewhere the name Irezumi. Why did you choose this specialty over another? It’s not the Irezumi style I realized in my first tattoos. I have both Irezumi tattoos and tribals on my body. 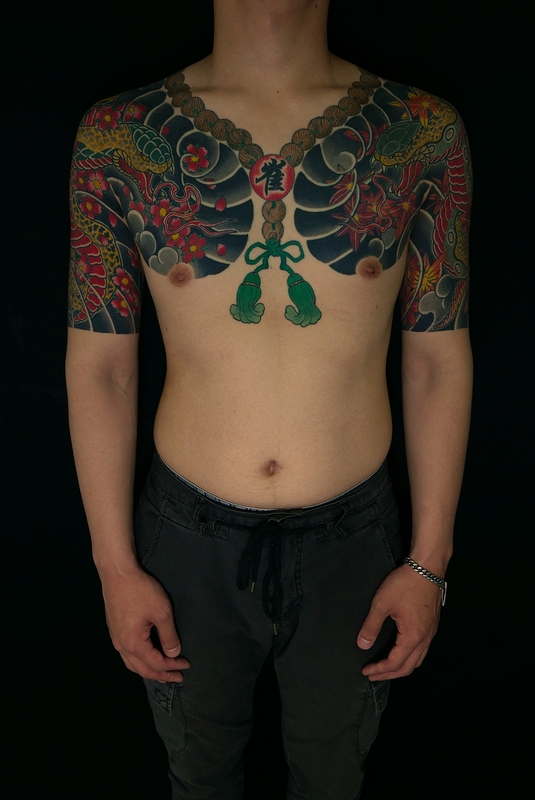 After the reason for this choice, I would say that Irezumi is a Japanese tattoo style, and Japan and Korea are really very close geographically: I will see easily Irezumi style tattoos. I feel attracted by the simple and strong style of the latter, especially with the thick lines and the solid line. In addition I think it has a much deeper meaning than any other genre. I do not think this depth can be created in 1 day or 2, so there is still more to explore for me. That’s what I try to work in any case and today is the representation that suits me best and best defines my style. By tattooing, have you noticed differences in the management of the pain depending on the origin of the tattooed ? I think the pain of the tattoo is the same whatever happens. I think that the management of this pain varies according to the skin but also the individual capacities of each one to bear the pain. Did the Tattoo World Show open the doors of an audience different from the one you are used to meeting? Of course. I met tattoos at the Mondial du Tattoo in general. The people I meet at tattoo conventions are always smiling and happy because they meet around the same center of interest. It will be perfect for the last word, thank you Horitaru! We wish a lot of success to Horitaru, which you can find on Instagram. You will have understood, the mentalities, European or Asian, evolve on the acceptance of the tattoo and on the image that this art returns. And you ? Are you tattooed or do you intend to go under the needle?